If anyone's a Buffy fan... I have both "Chosen" (from the final episode) and "Sacrifice" (from "The Gift") on my mp3 player. "Sacrifice" was playing whilst I read the "The Forest Again." It was ironic for me actually because as i started to read the forest chapter where harry sacrifices himself ...'who want's to live forever' breaking benjamin's version of the queen original came onto my mp3 player, made it all the more emotional to read. And then one by filter when i was reading the princes tale. Last edited by TheExiledOracle; July 24th, 2007 at 7:20 pm. For some reason the Hall & Oates song "She's Gone" kept going through my head when some characters died, because I've always thought it sounded more like a funeral song than a love song. I also thought of it when Ron left Harry and Hermione. I also imagine the Atlanta Rhythm Secsion song "So Into You" when Harry thought of Ginny. Well when harry was walking to his "death" "In the End" popped up in my mind from linkin Park. I'm more a fan of the Johnny Cash version of Hurt, so that one was stuck in my head. I also couldn't get Bruce Springsteen's Born to Run out of my head for the entire book. On judgment day, with nothin' to say? "Didn't we have a nice time?" The lengths that I will go to"
And I don't know if I can do it"
Trying to keep an eye on you"
That was just a dream"
Last edited by BelleSnowyOwl; July 24th, 2007 at 8:42 pm. I got home from B&N, read for 3 hours, slept for 8, read on the back porch, went for Dementor's Kiss ice cream with some friends , read, ate, read read read. My Harry-Ginny song is called "Just So You Know" (i don't know the artist though..Jesse McCartney?). He knows he can't take her with him because he loves her so much.. and he might never see her again. do you want me to have the feelings, and look the other way? Mostly I had completely random songs playing through my head, but had a few good ones. -Your Guardian Angel by Red Jumpsuit Apparatus when Harry and Ginny were kissing. That's their theme song, for me. -Justify, also by RJA, when they were raiding the ministry. But, really "Your Guardian Angel" seems like exactly what Ginny should sing to Harry. Augh! I was just waiting for a thread like this! Hurrah! Overall, I would say Wheel In The Sky by Journey really suits the plot. Surrender, which is also by Billy Talent is another song that makes me think of Snape and Lily. I Grieve by Peter Gabriel is just a good song for any of the deaths, particularily Fred, Lupin and Tonks. ooh, yes, that Buffy music is so well suited. I think I'd have cried ever harder (if that were possible) if I listened to "Sacrifice" while reading that chapter. My ultimate Deathly Hallows song would be "Doomsday" from the Doctor Who soundtrack. It's so haunting, and beautiful, and tragic all at once. Lovely piece. To Be Loved by Papa Roach while the Battle of Hogwarts and the fighting chapters after that. 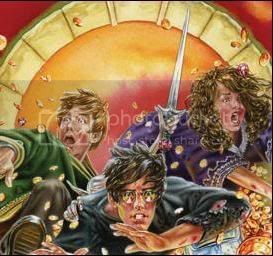 Do you see what happens when the trio spoils Book 7 to Voldemort? They get beat up, thrown into a super secret portal with a house-elf and have to wear funny clothes. Don't let this happen to you. Hah I began to wish New Line and Peter Jackson did the movies because when Harry is walking down towards Voldemort in the forest and James and Lilly etc are apearing I could hear that song from Lord of the Rings in my head when Sam's going " I made a promise Mr Frodo a promise"
During The Prince's Tale, I kept hearing A Window to the Past from the PoA soundtrack in my head. Made it all the more heartbreaking. Also, in the Epilogue, I heard that grand statement of the Family Portrait theme that the endings to PS and CoS both had. At the end of it all, I was praising John Williams for his wonderful contribution to the Potterverse. Ever since hearing this song I've thought is is just PERFECT for Harry Potter. If they ever incorporate any real world songs, and not compositions, to the movies, this of course, is just the perfect song for it. Obviously, I wasn't the only one to put it together in my mind as a perfect song. I've just now seen a youtube video of this song along with pictures from the movies. I've wanted to hear the song again, just now, and It is nice to see someone out there thinks like I do. You can easily find this if you'd like to see it and hear it . Just put in "Somewhere only we know". Although it started off reminding me of Harry and Ginny, especially the line about the fallen tree. Parts of Hogwarts were destroyed. So maybe it would be a nice song to play after Harry goes back to the destroyed Hogwarts. Although that didn't happen in the book, I can easily see him roaming the grounds afterwards and thinking like this. Thinking " Voldemort is dead. But look at everything destroyed. Is my life going to be simple now? Is this the place I used to love? Look at everything I have lost." I now can see it just being a perfect song for the whole series. trying to win her back. Please look up the song and listen to it , and post if you agree, these are the lyrics. I'm getting older and I need something to rely on. I came across a fallen tree. I felt the branches of it looking at me. Is this the place we used to love? Is this the place that I've been dreaming of? Oh simple thing, where have you gone? I'm getting older and I need something to rely on. So tell me when your going to let me in. I'm getting tired and I need somewhere to begin. Gosh, I love this song now! Please respond to me if you've ever heard it and you agree! Or face the wrath of the four-legged duckling of dooooom! Snapegirl! Yikes! Sooo good to see you again! I'm youtubing these songs. I've not heard some of them, but it is fun to listen to songs that others think are perfect for the book. Linkin Parks "In the end"
Well this song is an upbeat one, a good victory song. I think is a bit too upbeat sounding for a song to play at death. But I good song for Ron when he runs away, and is trying to get back to Harry and Hermione. He is kind of hitting himself isn't he, like "What have I done. She's gone. I've got to get back to her." I was never into Buffy, but that music "Sacrifice" is very sad indeed. A good song to listen to when reading about Harry's sacrifice. Pretty music and sad. Buffy and Chosen: I'm not sure if I am listening to the right music on this, but I am listening to a video that is supposed to have that music in it, and if I am listening to the right music, it is very dramatic, a good battle scene type music. Wow, this is great for Snape. And for Harry. Nine Inch Nails does it better than Johny Cash. He sounds really hurting as he sings it. I listened to both version. Breaking Benjamin sounds smoother and more modern. I liked it. It is a good song. Harry was was willing to die. He was thinking he didn't have a chance with Ginny and everything was already decided for him. He only had one sweet moment with Ginny. So sad. Weird how it was playing on your MP3 as you were reading. I'd have cried then I think. Or even for other couples. Yes, Harry probably feels like he is always running. Maybe other people also feel this way. Why didn't Snape ever tell Lily he loved her? He never said the words. I think this could be a good song. He didn't want to let James win, but he never told her he loved her. I wish he had said it all before he went. Oh yes, a good Ginny Harry kiss song! I'll have to look the lyrics on this one. I am having a bit of trouble understanding everything they are saying on this one, especially the screaming parts. I'm off to listen to some more of the songs suggested. I will post the rest of my thoughts in a bit. Last edited by Kidney Pie; July 25th, 2007 at 1:42 am.